It shows the impressive rise of the female employment rate in Japan, both in absolute terms and relative to the U.S. The participation employment-population ratio is now higher in Japan than in the U.S., which is something I didn't expect. The article is perhaps too quick to chalk up this rise to Abenomics. The timing is right, but I'm skeptical that the handful of policies introduced by Abe have overcome Japan's cultural biases and institutional barriers so quickly. Among OECD countries in 2013, Japan's female employment rate (62.5) is near the median (60), and clearly above the average (57.5). How about the gap between the male and female employment rates? The FT article highlights the "20 percentage-point difference" in Japan. Is that normal? 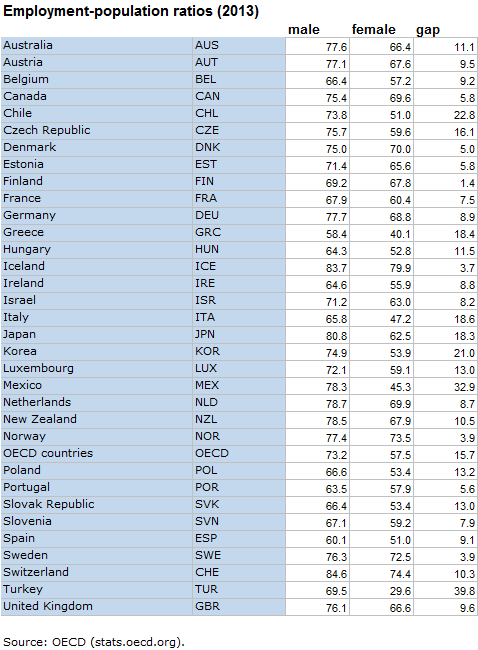 For the OECD as a whole, the male-female gap is 15.7 percentage points; in Japan it's 18.3. The largest gender gaps in the employment ratio are for Turkey (39.8), Chile (22.8), Korea (21), Italy (18.6), and Greece (18.4). Next was Japan. The smallest gaps are in the Nordic countries, followed by Portugal (! ), and Canada. I was also surprised to learn about the low correlation between the male participation employment rate and the gender gap in participation employment rates. So, the female participation employment rate in Japan is now in line with that of other rich countries, but the gap between men and women is still quite higher. Edited on 8/14/14, at 4:15pm CT, to replace "participation rate" with "employment-population ratio" (or simply, "employment rate"). They're not the same thing. Sorry about that.